L' appartement est vraiment idéalement situé. Il se trouve au centre ville juste 2 pas de la célébre rue piétonne (rue Váci). D' ici vous pouvez vraiment aller partout á pied. Il se compose de 2 chambres á coucher séparées plus un salon avec la cuisine. Puis il y a la salle de bain avec une douche. toilet et bidet. Il est vraiment comfortable pour 4 ou meme pour 5 personnes. L' appartement se donne sur la courte interne alors il est tres-tres calme et vraiment lumineux. J' en suis sure que vous allez vous sentir trés bien. Si vous avez n' importe quelle questions soit sur Budapest soit sur l' appartement je suis á votre disposition. Je peux vous aider aussi avec le transportation depuis l aéroport. Cette appartement vous offre la meilleure location. L' appartement est particulierement calme comme il s' ouvre sur le courte interne et se trouve dans une petite rue piétonne juste á coté de la principale rue piétonne 'rue Váci'. Central, calme, grande et comfortable avec 2 chambres á coucher. 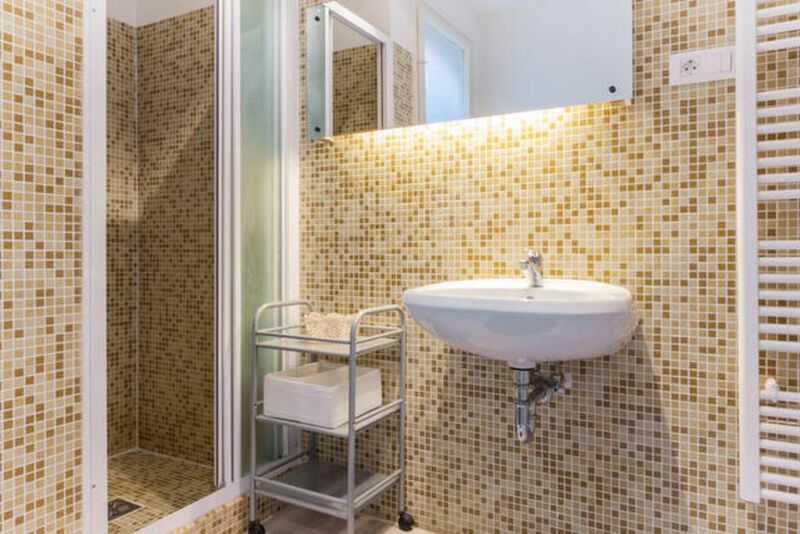 Lumineux et tres joli salle de bain avec un bidet. La cuisine est une cuisine américane avec le salon. Elle est trés bien équippée. Appartement spacieux et très bien situé. Possibilité de faire plein de balades à pieds depuis l'appartement. Great property in the heart of the city with lots of great places to eat and shop nearby. Most of the main attractions within walking distance with a young family. Only used the public transport once for the zoo and baths and that was easy too. Flat was comfortable in a busy safe area with everything you would need for self catering (if you want it). Rita arranged for a cab to pick us up and drop us to the airport. Communication was excellent as well. A wonderful stress free stay in a fabulous city. The Apartment is an excellent base for exploring Budapest. Located in a quiet street near the city centre you can choose the local neighbourhood vibe or the buzz of the centre just streets away. Perfectly equipped for our needs and a generous size for a city centre apartment. It was clean and tidy and everything was in good working order. For any English visitors like us note there is a kettle (one of my top priorities). Very well priced, especially for something so well situated in the city. The neigbourhood itself felt very safe and the locals were very frienfly and helpful. All in all an excellent choice of accomodation and we would be more than happy to stay here again. Wir waren vier Tage hier, die Wohnung liegt sehr zentral und ist dennoch ruhig. Sie ist mit allem nötigen ausgestattet. Auch der Kontakt war sehr freundlich und immer zeitnah. Wir können die Wohnung nur empfehlen. Safe walkable location. Excellent base to explore Budapest and vicinities. We spent 7 nights at this place. Apartment is conveniently located , very close to metro , tram and grocery stores. Has well equipped kitchen . Good size windows and high ceilings make rooms feel large enough and comfortable. Internet was reliable. Owner was very easy to contact and fast to respond. We enjoyed our stay. I spent a few nights here in early April. First, let me say that yes, I can imagine the lack of air conditioning in summer months to be an issue. There are HUGE windows that can be left open to allow a nice cross breeze, but I do not know how well it would cool things off in August, especially with this being a top floor apartment. But other than that, this apartment was perfect for me. First, the location -- a nice quiet side street but just a block away from Central Cafe, Vaci Street, and two blocks from Deak metro stop -- seriously, the location could not get any better. Want to walk in the morning to the Central Market? 5 mins. Want to have a beer at Jonas Craft Beer on the river during the sunset? 5 minutes more. Ride my bike or walk on on the Danube? It's right there. Walk across the Chain Bridge? Minutes away. Go to a museum, or the ruin pubs? Everything minutes away. If you're looking for an apartment that is the epitome of opulence, perhaps this isn't the one for you. But for me, I need a place that is clean, quiet, convenient, and has good water pressure (I like my showers). This place has it all. (Texte traduit automatiquement) Je vais fournir des livres et des cartes et quelques conseils personnels en fonction de vos besoins.